My first career as a Professional Engineer drug me through the bowels of industrial America. After having seen the unseen, and ambition being the better half of envy, I became a financial student mastering the financial metrics of business administration. From then until now, I've been a professional student of Modern Portfolio Theory, Monte Carlo analysis, Taleb's concept of Fragility and the world's market exchanges where I still find wonder in the cause-and-effect of financial systems. A passing glimpse of repeating anomalies, and hyperloops of disconnects on the balance sheets of small, middle and metro-America, morphed into a two-year study of a melting municipal candle burned on one end by unsustainable pensions and engulfed on the other by boilerplate neoliberal central planning. What began as academic jump rope ramped up to the most fun I've had in years. Blinded Authority by Chad Boles is a political and financial thriller that delves into the dark underbelly and machinisms of corruption in a fictional Florida county's economic affairs, where transparency is as elusive as the truth, and the truth can be just about anything, depending on who's doing the talking. Orthus County is the primary setting of Bole's intelligent narrative and it follows the strategic maneuvering of money from the point of view of several well developed characters. When a series of intricate, nefarious transactions are manufactured, the county and those involved struggle to prevent an imminent financial collapse and the fallout of all those with even a hint of association. Chad Boles has written a deeply gripping and eerily familiar story line in Blinded Authority. I had a genuine love/hate relationship with the characters and was intrigued by their motives, relationships, and cataclysmic failings. While at first glance I worried that the theme might be a bit too complex, that concern was alleviated within the first few pages. Boles writes with authority in a narrative that can be fresh and often even funny while maintaining the plot's grim tone. There is a humanity to the players despite words and actions that irritate long after the book has been finished. Ultimately, it is people who orchestrate demise...and their humanizing required a skilled hand, one which Boles clearly possesses. I feel like this is one of those books that would play out well on the screen and believe this story will find a wide and captivated readership as the frailty of America's economic system is exposed. Blinded Authority is a political thriller by author Chad Boles. Set in the world of finance and explored through various levels of the system, greed and corruption are exposed at every turn as transparency is given over to pure indulgence. An unusual cast of characters populates the book, from Ezzy King, the affected heiress, to a juicy corporate empire, to an everyday Florida sheriff embroiled in a complex world he’s trying to connect with. Set in a wide-reaching landscape from the big city to the small town, this ensemble cast displays the causes and effects of financial corruption from those who suffer and those who gain, taking readers on a politically-charged power journey towards total ruin. Reading Blinded Authority was like being on a non-stop train when you know the bridge has already been blown up ahead. I wasn’t shocked by the corruption that Chad Boles brings to life so accurately, but the way he weaves his narrative towards its inevitable conclusion was gripping and startling. There’s a great deal of intricacy to the work, which indicates clear research and knowledge on the part of the author, but that’s not done at the expense of character development as so many political thrillers are these days. Boles’s ensemble is populated with realistic people who leap from the page and either endear themselves to you or make you hate them with a fervor. I would highly recommend Blinded Authority to readers who delight in realistic fiction with both suspense and high levels of detail. Blinded Authority by Chad Boles is a political thriller like no other. Political high-fliers Paige and Stan Jackson, Ezzy King, an heiress, and Sheriff Bill Bolek. Not people you would expect to walk the same road, but all are thrown together when financial chaos strikes hard. Corruption, mistakes, greed, and two-faced politicians mingle together in a political story surrounding the Great Financial Crisis. Public money is being spent on large projects with no accountability to back it up. Municipal bond debt is spiraling out of control, balance sheets are wrecked and the great country of America is facing down its biggest threat yet; bankruptcy. Can a citrus heiress, a district attorney and a sheriff save the day or is the country about to reap the rewards of its own greed? Blinded Authority by Chad Boles is a fast-paced thriller, with not just a great plot but plenty of useful information to learn along the way. If you don’t know much about finance before you start, you will when you’ve finished. Mr. Boles deftly weaves his own experiences and knowledge through a story which is sadly close to the truth. America may not be facing bankruptcy but like most other countries, it has its fair share of greedy, corrupt officials and characters you would run a mile in the opposite direction to avoid. Not only does Blinded Authority have a realistic plot, it has well-developed characters that are also all too real - some likable, some not so much - but all of them are identifiable with plenty of backstory to give them even more of an air of reality. Great story, tight plot, plenty of action and good characters. A really riveting read, ideal for those who want a story they can truly get their teeth into. A tale of power and money and what happens when the economy suddenly goes down and when the stock market plummets. Blinded Authority by Chad Boles is a riveting thriller, a novel that follows the lives of significant players in the financial and political arena, and how they become victims of a world quickly falling apart, a chaos they inadvertently created. For instance, when the economy fails, what happens to someone like Ezzy King, set to inherit one of the most powerful corporations in the country? What does it take to recover from financial catastrophe? Chad Boles plunges readers into a world that is strangely familiar, with ambitions swelling in the characters, the seething itch for wealth, and stabbings-in-the-back. The first thing that caught my attention when I started reading this book was the author’s deft handling of character. Chad Boles creates characters that readers will enjoy, and the political game comes across in the narrative. The conflict grows quickly and readers will see where wrong choices and greed can lead. The writing is impeccably good, and the narrative features great dialogues and vivid descriptions that allow readers a deeper understanding of the three-dimensional characters. 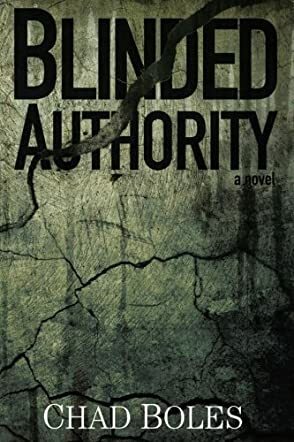 While Blinded Authority may have sophisticated characters, the plot is skillfully handled and readers will enjoy the way the author portrays the cause-and-effect relationships in the narrative. The narrative voice is compelling and it allows points of view to come out clearly. This is a book that will delight readers who enjoy great writing and a character-driven story. It’s a tale of power and control, a tale that explores the subtle ironies in the political and financial game, and the author shows an incredible understanding of the subject. It is a spellbinding novel.